Dan Zimmerman, a blogger who writes outdoors posts on a website called The Truth About Guns. Dan was kind enough to drive down from St. Louis. Writing a feature about duck hunting with Intercoastal Safaris. In addition Dan goes into detail about his hunt. Second his descriptive words are matched with the photo’s he had taken during his trip. 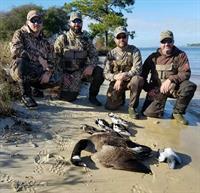 In addition if you’re curious about what its like to hunt ducks on the coast of the gulf, then give this article a read. It is detailed and accurate to what you can expect from hunting ducks with Intercoastal Safaris.